Walking on broken glass | hear.here. A year ago today, I was heading into surgery to get my cochlear implant. I really had no idea what I was getting into, but one thing I knew for sure: it was going to be a lot of work. I’ve actually been really lucky because my brain adapted quite quickly once I was activated, and I was understanding speech the same as a hearing person within a few months. But even almost a year after my activation there is one thing that is still difficult and will never change: what I hear now will never sound “natural”. I was always that person who could listen to music on CD, or as an MP3, and would say, “that sounds digital”. I’m the one that, even after my hearing loss, can distinguish between original recordings and digitally remastered ones. There’s just always a hint of “electronic” sound. That’s what my hearing via cochlear implant will always sound like to me. Digital. Because it is. Recently, I got into a discussion with someone online who is bilaterally implanted who says her hearing sounds natural and like what she remembers hearing. I have to inherently disagree with her, which may not be a popular opinion amongst others with CIs. Either she is capable of ignoring that digital tinniness (likely) or she is not actually remembering what natural sound sounds like. Since she is bilaterally implanted and has no remaining natural hearing, she is not having the instant comparison to natural like I have. By being bimodal and having some natural hearing in my left ear, I have that comparison every minute I’m wearing my CI. My hearing aid is digital, and I’ve always only had digital ones. And there have definitely been times when I have thought, “this sounds digital”. But what it does is amplify and fine-tune sound. By it’s very nature, a hearing aid is still using the natural sound of the ear for sounds to be heard. So while it is producing digital sound, it is still natural digital sound. 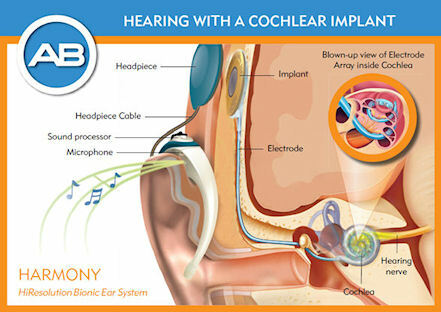 A cochlear implant bypasses the external portion of the ear and the sensation of sound is created internally by electrodes stimulating the auditory nerve. Essentially, they are a machine (computer if you prefer) that replaces the damaged part of the ear that has caused the individual to be hard of hearing. So by default, the sound created by a cochlear implant is not natural, but electronic. My brain knows this, and recognizes that not-natural sound. There are moments where it is “close”. Just like the 2005 digitally remastered version of George Michael’s “Faith” sounds really close to the 1987 original version. But my brain knows the difference and there is nothing I can do about it. Therefore, I am of the belief that my cochlear implant will never sound “natural” to me. I’m okay with this, because any sound is much better than no sound at all. And the fact that it can even come close is astounding. Having this discussion with others with CIs, I am often looked at as the “bad guy”, because everyone wants to cling to the hope that what they hear will someday sound like their natural hearing once did. Or what they think natural hearing sounds like if they’ve never heard it. I’m happy for them if they reach the point where they think it is the same. More power to them. It’s not something I ever really believed when I started this journey. In other news, we went on a cruise. It was pretty awesome, save for the lack of outlets in the cabins. With every device, including my CI batteries, needing to be recharged every day, we were swapping things out on a schedule, and often charging our phones using either Ed’s portable charger the outlet above the bathroom sink (that only was on when the bathroom light was on). But we made it work. And I did a pretty great job with understanding people. Our friends’ 6-year-old son was a little difficult, with his missing two front teeth, and sometimes the sheer amount of sound from just the number of people on the ship was overwhelming. 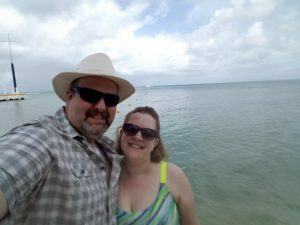 We went to Cozumel for the day to an exclusive beach and went snorkeling again. I was able to use my AquaCase again and it was once again amazing and awesome. It was an even better snorkeling experience than the Keys, and I can’t wait to be able to go back again someday. While on the ship, I did karaoke for the first time since November. Note to self: go more often! I had very little anxiety about it and was able to hear pretty well. Am I 100% pleased with my performances? No, but who is? The first song I chose was an old standby of mine from the late 90s when I was doing karaoke every weekend at China Garden in Coralville, Iowa. You can watch the video of that one below. The title reminds me of how I feel when I’m having conversations with others, such as those above, where I am trying not to offend anyone but also feel like I need to recognize that my feelings and my hearing are what they are to me. My friend Angela said afterwards, “You should’ve ended with ‘and I’m deaf’ and just drop the mic.” The other song I did was one near and dear to my heart, a Whitney Houston song, that I don’t feel like sharing yet – not a lot of people have heard me do that one and I want to keep it special.